Samuel Jablon, Linger Longer, 2017. Acryllic on Canvas, 50 x 38 inches. I started this painting as I always do: I looked back through sketchbooks, notes, and works on paper. To find a text that resonated. I found a watercolor on paper in this stack from a series I made in Brussels. 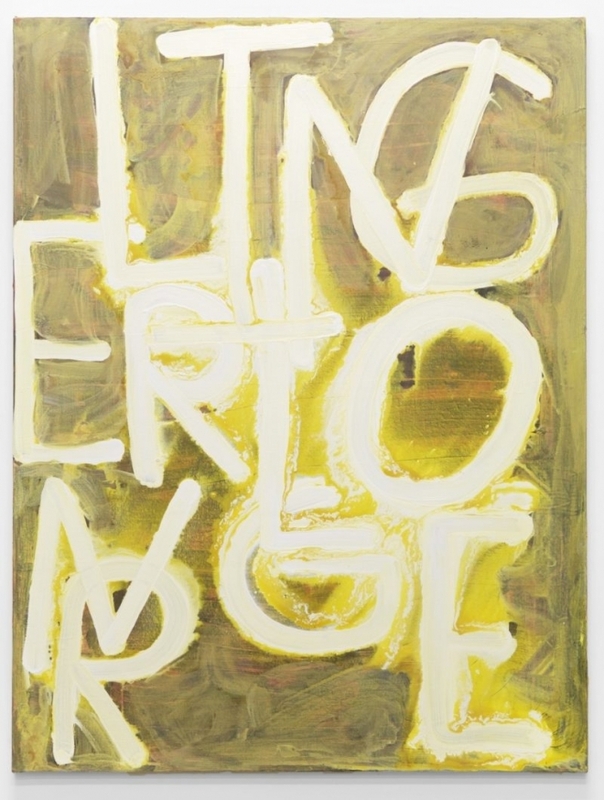 This work titled Linger Longer came out of feeling dejected and optimistic during a residency in a penthouse at a hotel. It was forgotten decadence reduced to a half squat; both beautiful and bleak. The views of the Botanique were breathtaking, but the rooms had seen better days—in its prime it housed celebrities like Ronald Reagan and Michael Jackson. To enter the penthouse you must go through the hotel gym, open a secret door, and climb a chrome spiral staircase. Once in the room you’re met with 360° views of Brussels. The light was perfect for working. I wanted to capture it in paint. I made hundreds of works on paper and painted one with the text “linger longer.” It was the source for this piece. In Brussels I was introduced to a curator who offered me a solo show in L.A. Once I returned to N.Y. I prepared for this show, and the text stuck with me.The painting I was working on was a mess: There were puddles of watery paint everywhere, my shoes were ruined, pants were ruined, shirt was ruined, the painting was generally fucked. At this point I was like “Who cares, it can’t get worse.” So I kept painting layers, textures, and colors. I poured more water on it and grabbed a jar of white paint. I wrote out L I N G E R L O N G E R on the water-soaked canvas. It kept dissolving and I kept repainting each letter… this went on for hours. I painted until the letters stopped dissolving, and then I noticed the painting glowed, so I walked away. Samuel Jablon’s Doomed is on view at Ballon Rouge in Los Angeles from January 27 through February 3.